Published Jul 24, 2017 By Julia 3 CommentsThis post may contain affiliate links. 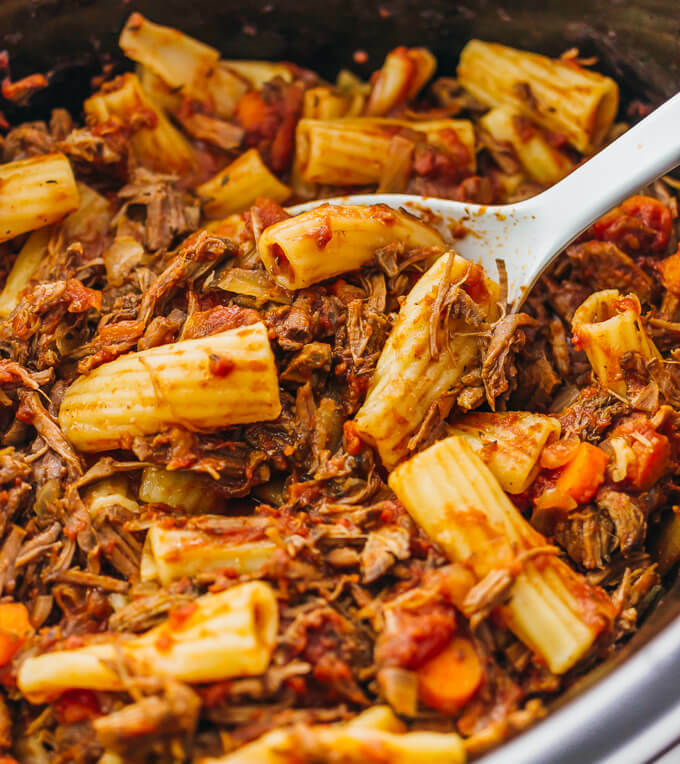 Here’s a recipe that really makes the slow cooker shine: a deliciously tender shredded beef ragu sauce paired with rigatoni pasta. Sometimes I feel guilty when months go by and I haven’t used my slow cooker at all. It’s such a fabulous appliance that I really enjoying cooking with, so I’m loath to see it collecting dust on a shelf. 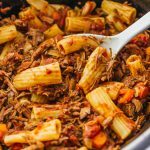 Recently, I came across an old recipe of mine from years ago — a saucy ragu pasta — and I thought that it would be a perfect slow cooker recipe. It’s practically the poster child for slow cooker recipes because it requires very tender shredded beef, which requires long hours of cooking. To make it, all you need is a budget cut of beef, rigatoni pasta, a few veggies, a can of crushed tomatoes, and some spices. Hours later, you’ll end up with delicious meaty pasta that will have your house smelling great and persistent questions from everyone asking when it’s going to be ready to eat. My recipe is different from your typical ragu recipe because everything cooks in one pot — the slow cooker. This includes the rigatoni pasta, which means you don’t need to use a separate pot to boil water for cooking the pasta. 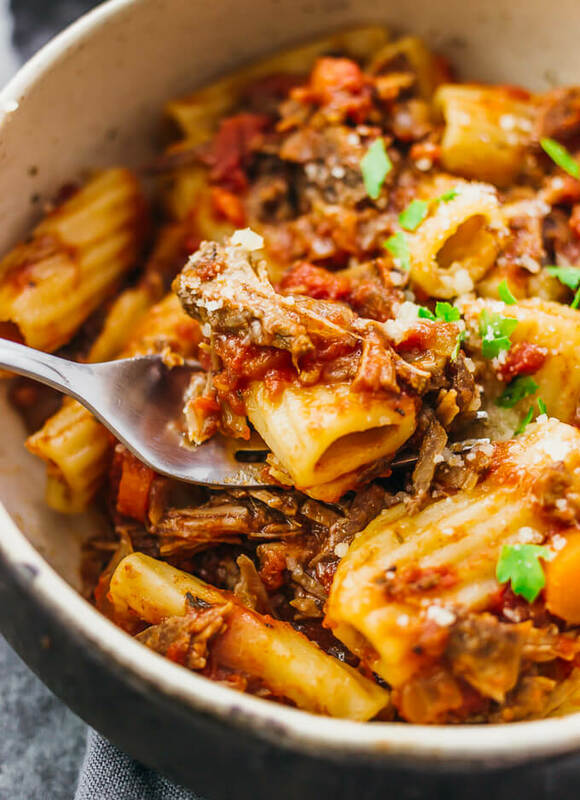 The rigatoni is added during the last steps of the recipe, and because it’s cooked in the slow cooker, it has the soft and tender texture of baked pasta. It takes my slow cooker about 45 minutes to cook the rigatoni to my preferred doneness. Optionally, you can cook your pasta separately by boiling it in a separate pot. If you do so, you should add less beef stock to the slow cooker (1/2 cup only). After the pasta is cooked, stir it with the beef ragu sauce in the slow cooker so that the pasta can absorb the sauce. Beef: Almost any cut of beef will work for this recipe since it’s slow cooked for hours. I prefer leaner cuts with the fat trimmed, and boneless. I recommend using beef stew meat or flank steak. There’s no need to use any expensive cut of beef since it’s going to be slow cooked until it’s practically falling apart. This is where you can use a budget cut of beef and it will taste great regardless. Pasta: The recipe’s liquid amounts and cooking estimates are for rigatoni pasta. You can certainly substitute with your favorite kind of pasta — pappardelle is a common choice for ragus like this — but you will need to make other adjustments to the recipe accordingly. Depending on what you use, you may need to cook for longer or shorter periods of time until the pasta is tender and you may need to add more liquid if the slow cooker gets too dry. I recommend using a slow cooker liner — if you haven’t used it before, it’s essentially a large disposable bag that you place over your slow cooker. The food goes directly into the bag and it makes cleanup really easy. It’s safe to use and I use it all the time, especially for stickier foods that tend to stick to the pot. Apparently, you can even use multiple liners to cook multiple dishes at a time. If you don’t have a slow cooker, you can make this recipe using a dutch oven instead. Follow the recipe as instructed except for the cooking time estimates. The beef is done when it takes very minimal effort to shred it using forks — there shouldn’t be much resistance at all, otherwise it needs more cooking — and the rigatoni is done when it’s tender to taste. For more meaty beef dishes, check out my Hungarian beef goulash, beef stroganoff with flank steak and mushrooms, and Mongolian beef. 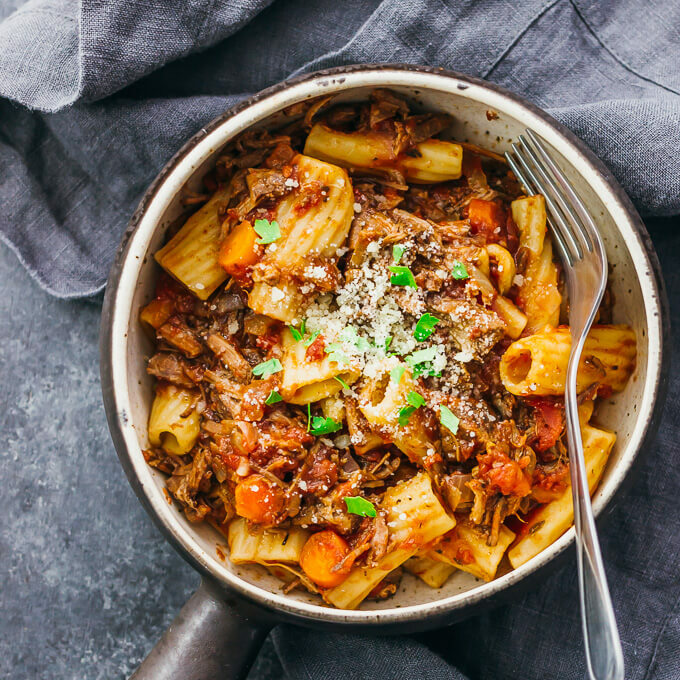 This ragu pasta is made using shredded beef after hours of cooking, paired with rigatoni pasta. 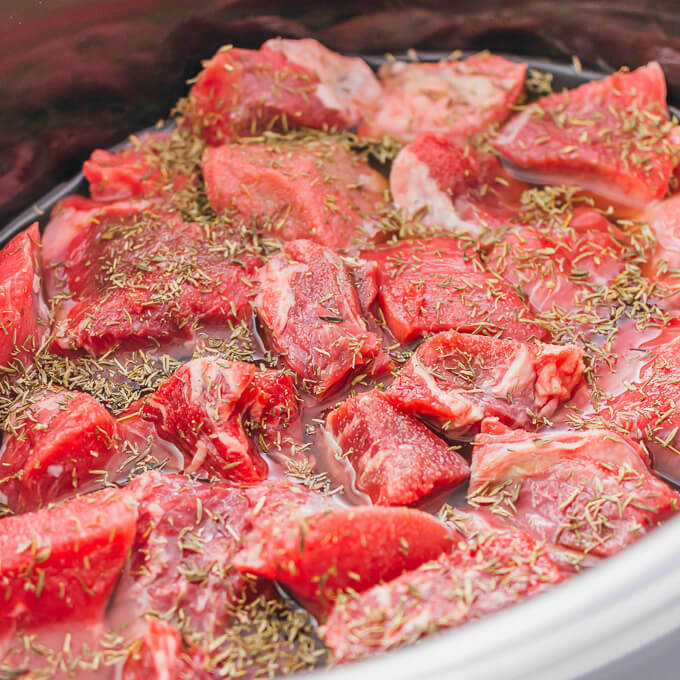 Add beef broth to a 6-quart slow cooker. Add beef chunks in a single layer, and sprinkle salt and thyme over the beef. Drizzle balsamic vinegar on top. Evenly distribute carrots and onions over the beef. Pour can of crushed tomatoes on top. Cover and cook on high for 5 hours. Uncover and transfer the beef to a plate, leaving everything else including the liquid in the slow cooker. Use 2 forks to shred the beef. 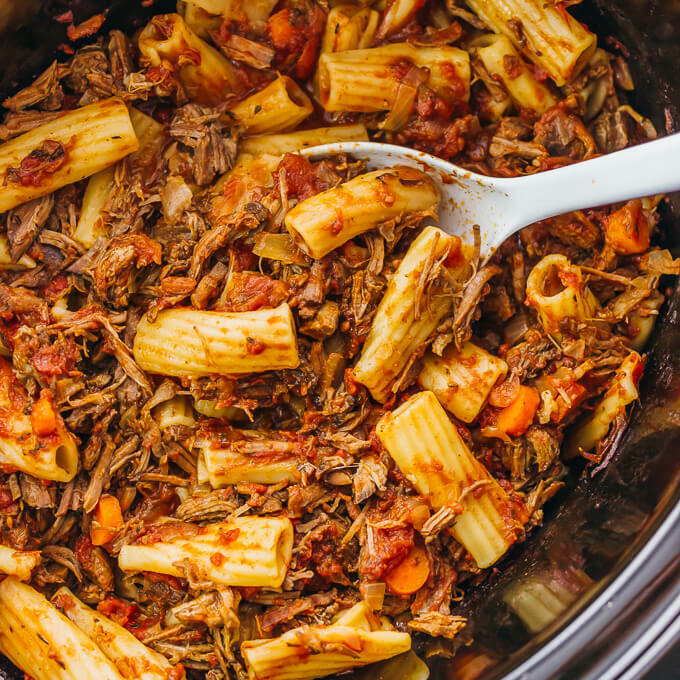 Add rigatoni pasta to the slow cooker, stirring with the liquid. The rigatoni should be completely submerged. Evenly distribute the shredded beef on top of the rigatoni, patting it down to make contact with the liquid. Cover and cook on high for 45 minutes. Uncover and taste the rigatoni for doneness. If not tender yet, stir and cook on high for another 30 minutes or until cooked through. Stir and serve hot. Top with grated parmesan cheese and chopped parsley. My rigatoni fell apart in the crock pot. What would you suggest to prevent this from happening? I suggest cooking the pasta separately by boiling it in a pot. If you do so, you should add less beef stock to the slow cooker (1/2 cup only). After the pasta is cooked, stir it with the beef ragu sauce in the slow cooker so that the pasta can absorb the sauce.